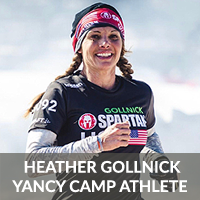 Premier OCR Athlete Heather Gollnick - Yancy Camp - Fitness for Everyone! Heather is the 2016 Spartan Masters World Champion and was voted the 2017 and 2018 Masters “Female Athlete of the Year”. Heather has over 50 podium finishes in the Female Elite & Masters Categories. She is a member of the Spartan pro Team, holds her SGX Level I & II Certifications, teaches SGX Specialty classes for Spartan, is a motivational speaker, and loves to share her vast knowledge of racing and training with her OCR clients. Heather has been coaching athletes for over twenty years and has a passion for helping others reach their athletic goals. Heather raced as a professional triathlete for a decade. She is a 5x Ironman Champion, past Age Group National & World Champion and is the Head Mens & Women’s Triathlon Coach at Liberty University.